Inflation is one of those drab topics that many people do not think much about. We have all gotten accustomed to it. Prices gradually adjust upwards, and life goes on. Its gradualness is what makes it so unnoticeable. But with wage rates falling, and fuel, housing and interest costs rising, Americans are feeling the pain more acutely. Just reflecting on what the cost of living was in the 1960s is enough to make one realize that inflation is not benign. In 1965, the cost of a new home was about $21,000, a new car averaged $2,650, a gallon of regular gas was 31 cents, a first class stamp was 5 cents, and the Dow Jones index was under 1000! Today, all these are about 10 times higher. The Marriner S. Eccles Federal Reserve Board Building, on Constitution Avenue between 20th and 21st Streets, NW, designed by Paul Phillipe Cret and completed in 1937. If you take today�s average house cost to be about $200,000, the average new car cost to be $18,000, and the average cost of a gallon of gas to be $3.00, the price increase for homes, new cars, gas, postage, and the Dow Jones over the 42 years since 1965 is 852%, 579%, 868%, 680%, and 1200%, respectively. And yet, the government tells us that the annual percentage change in the Consumer Price Index (CPI) ranged between 1% to 13%, but remained mainly near 3% over those 42 years. At first, this seems tame. After all, that would mean that prices increased by 3% x 42 years, which is only 126%, right? Think again. To correctly calculate the price increase according to the CPI is simple. It is the percentage change in the CPI index from its January 1965 to January 2007, and this is a whopping 549%. What does this mean for a person�s buying power and for his retirement? Let us look at a 30 year span. According to the Bureau of Labor Statistics, the purchasing power of 100,000 1977 dollars decreased by over 60% during that 30 year period. It takes $338,864.69 today to purchase the same goods that were purchased for $100,000 three decades ago. Look at it another way. If you were to retire today, you might desire an annual retirement income of $30,000. But with an inflation rate of 3%, to retire with that real income 30 years from now, you would need an annual retirement income of $72,818! If the inflation rate were 6%, your annual retirement income would need to be $172,305 to meet the same retirement income target. For the purpose of illustration, let us consider the saver with an annual income of $65,000 who simply puts his money in a shoe box over a 30 year period at a rate of $10,000 per year. With a 3 to 5 percent inflation rate, retirement at age 65, and annual retirement expenses of 50% of his preretirement income, this individual�s savings will be completely consumed by age 69 to 70. So after 30 years of carefully putting aside over 15% of his gross income every year, he only has enough to live 5 years! Americans have gotten used to this situation. It is understood that a viable retirement plan includes investments with annual returns of 10% or more in order to keep pace with inflation. But there is something definitely unfair about the way inflation robs ordinary people of their wealth to the extent that they lose about 60% of the wealth that they hold in dollar assets. That 60% represents the product of their ingenuity, sacrifice, and toil. And if this is the case, then why do we tolerate a monetary policy which robs Americans of their hard-earned wealth? It is thought provoking to consider what the saver would gain by zero-inflation. Consider the case of the person mentioned above who socks away $10,000 a year, but this time in investments returning 10% annual growth before retirement and 6% after. With zero-inflation, he would have a sustainable retirement with 50% of preretirement income until age 99, with retirement possible at the early age of 55! But with 3% inflation, annual wage increases at the same rate of inflation, and with the same percentage return on investment, retirement at age 55 would cause the individual to be destitute by age 68! So with the currency inflating at 3%, it takes at least another 8 years of his life to provide retirement security. At 5% inflation, he must work until 71 years -- another 16 years! Americans do not reflect enough on inflation. If they realized how much they would benefit without it, there would be a mass movement demanding a return to the gold standard -- this would tie the dollar to a specific amount of gold, thereby preventing currency inflation. The problem is not just inflation, though; it is that Americans are deceived about the degree of inflation. If the public comes to realize that the true inflation rate is much higher than they are being told, there could be flight from stocks, and bond yields and interest rates would rise. One of the negative aspects of inflation is that it gives the federal government the opportunity to manipulate inflation statistics, in particular, the Consumer Price Index (CPI). The CPI, published since 1921, was once measured by sampling the cost of a fixed market basket of goods. It estimated the cost of maintaining a fixed standard of living, and came into wide acceptance after World War II. However, since 1996, the computation of the CPI has been radically altered. Geometric weighing is now used to reduce the impact of spikes in commodities such as energy, and complicated formulas are used to understate the price of products to account for improvements or added features. 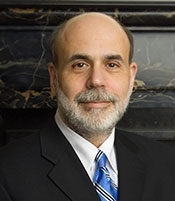 Ben S. Bernanke was sworn in on February 1, 2006, as Chairman and a member of the Board of Governors of the Federal Reserve System. For example, the Bureau of Labor Statistics (BLS), which computes the CPI, concluded that a particular TV set had an improved screen, and that the increased value of the screen should reduce the real total cost of the TV. According to one source, the improved screen was deemed to be worth $135, and so the price of $329.99 was then reduced by that amount, allowing the BLS to claim that the price had fallen about 30%! Other changes to the CPI computation include "Substitutions" and "seasonal adjustments". A substitution smoothes out spikes in prices under the reasoning that a consumer will switch from one product to another when there is a price increase. Although there is merit in the reasoning, this means that the CPI is no longer a measure of the cost of maintaining a fixed standard of living, but is now closer to a measure of what is needed to merely survive. This new methodology is also inherently dangerous, because it depends on personal opinion. It is no longer chained to measurable hard data as the old fixed market-basket CPI was. This leads to the possibility of "tweaking" for political gain. Since government benefits, like Social Security and pensions, are indexed to the CPI via Cost of Living Adjustments (COLAs), tweaking is directly to the government�s benefit. Manipulating of the CPI also affects pay-outs to holders of some government bonds, specifically TIPS (Treasury-Inflation Protected Securities). By using statistical techniques to understate the official rate of inflation, government expenditures are greatly reduced. One economist claims that cumulative effects of changes made to the CPI during the Clinton administration have reduced Social Security payments by about 50% from what they should be today. The controversy regarding the CPI is extremely important to all Americans. As was already shown, understanding what the true inflation rate is is critically important to one�s retirement planning. Additionally, many private sector wage contracts and pensions are indexed to the CPI, so statistical shenanigans can rip off workers and retirees in many ways. Manipulation of the CPI has many additional far-reaching consequences. According to the BLS, "over 2 million workers are covered by collective bargaining agreements which tie wages to the CPI. The index affects the income of almost 80 million people as a result of statutory action: 47.8 million Social Security beneficiaries, about 4.1 million military and Federal Civil Service retirees and survivors, and about 22.4 million food stamp recipients." The annual percentage change of the CPI is now calculated to be 2.6%. Many, from ordinary citizens to businessmen, question this number because they experience annual price increases which are closer to 5%. 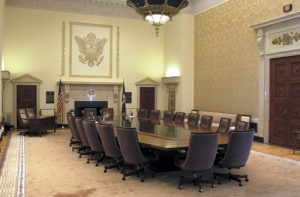 Board Room where the Federal Reserve Board Members meet. 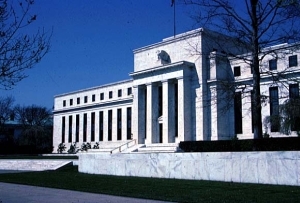 John Williams, an economist who has had a career consulting for Fortune 500 companies and who publishes the newsletter "Shadow Government Statistics," estimates that the true inflation rate is about 7% greater than the government�s CPI, which would put it at about 9.6%. He also calculates the "Pre-Clinton Era CPI", which is now showing a percentage change of 6% -- much closer to the annual price rises that ordinary people are experiencing. Whether it is 5%, 6%, or 9.6%, sustained inflation rates of any of these levels will spell disaster for the retirement planning of many ordinary Americans who blindly trusted in the government�s statistics. However the problem does not end here. 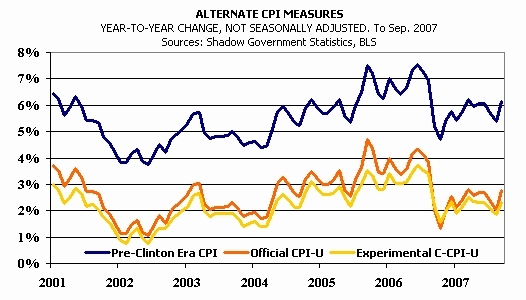 Distortions in the CPI also have an effect on other statistical measures. According to Williams and others, the GDP is a case in point. Since the CPI is used to deflate components of the GDP, it is believed that the GDP is overstated by 3% a year! This could lead us to conclude that many of the recent recessions have been deeper than has been publicly stated due to the incorrect reading of growth given by the GDP numbers. As previously mentioned, the solution to all these ugly problems is a return to the gold standard. Not only would this prevent currency inflation -- the expansion of the money supply -- but it would impose fiscal discipline by making it impossible for the government to fund its operations by printing money. Fiat currencies, currencies not backed by precious metals, are often associated with the expansion of government. Britain got off the Gold Standard in order to sustain its high-spending levels during World War I, and it was considered impractical for it to get back on it after the Second World War had depleted its gold reserves, again, because of its previous high expenditures. This illustrates that high government spending is not generally compatible with a currency pegged to gold, and that there is a definite synergy between efforts to limit government expansion and the Gold Standard. Our founders had a sense of the unreliability of fiat currencies. Prior to the revolution, some colonial governments issued bills of credit, which circulated like currency. They also were known to depreciate in value as time went on, just as our currency does today. The Constitution makes it clear that it was the intention of the founders, who were formed by their experiences, that we be on a coined-money currency standard. Article I section 8 gives Congress the authority to coin money, and this is made exclusive to congress in section 10, which prohibits the states from doing the same. To coin is "to stamp pieces of metal for use as a means of exchange in commerce, according to fixed standards of value." Article I, section 10 specifies that the coin was to be solely "gold and silver". As is often the case, returning to the wisdom of our nation�s founders would solve many of our current crises. On the issue of monetary policy, this is exactly what our party platform calls for. Until this happens, government will continue to have the capacity to expand by silently robbing ordinary citizens of their savings, while they spend a decade or more of their lives just working to keep ahead of the damage inflation has done to their lives.